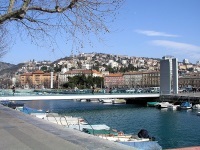 The commercial capital of the idyllic Adriatic Coast is the cultural city and holiday destination of Rijeka, with its international harbour lending it a cosmopolitan flair. Rijeka is not only the gateway to the beautiful coastal island resorts, but a tourist's delight in itself with its charming historic buildings. A stroll along the Korzo Promenade in the old part of town provides an eyeful of classic buildings and a variety of street cafes ideal for resting your feet and enjoying the passing parade. Rijeka also has an annual carnival full of lively music and dancing, providing a glimpse into ancient Slavic folklore and mythology. Revellers don masks to scare away evil forces and there are numerous events, concerts, and the carnival parade. There is plenty to eat, drink, see, and do in this vibrant port city. The best way to see Rijeka's cultural and historical attractions is to follow the well-worn tourist path that takes in all of the most important sights of the town. Most of them are accessible by foot, as they are located in or near the city centre. To see Rijeka's remarkable Trsat Castle, visitors need to grapple with some formidable stone steps. But it is certainly worth the climb.